The seriousness of this inquiry into Sessions’ confusing (at best) testimony is still unclear. It’s unclear how actively federal authorities pursued the matter in the months before Sessions’ interview with Mueller’s investigators. It’s also unclear whether the special counsel may still be pursuing other matters related to Sessions and statements he has made to Congress — or others — since his confirmation. The Special Counsel’s office has informed me that after interviewing the attorney general and conducting additional investigation, the attorney general is not under investigation for false statements or perjury in his confirmation hearing testimony and related written submissions to Congress. This new revelation, combined with the minefield of lies and half-truths that Congress has navigated during Sessions’ various testimonies under oath, should further rattle a White House under siege. 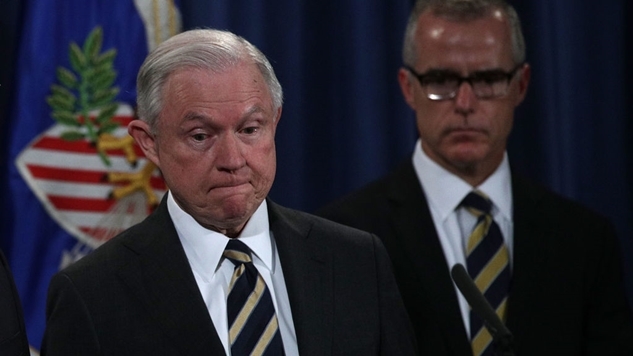 There’s no confirmation of this, but Sessions firing McCabe two days before he was set to retire and receive his pension sure seems like a natural catalyst for this leak. As always in Trumplandia, the boomerang they throw at their intended victims inevitably will come back to hit them in the face.